Pastoralist traditions have long been extraordinarily important to the social, economic, political, and cultural life of western India. 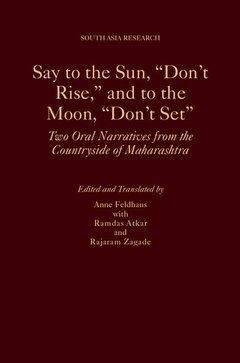 The Marathi-language oral literature of the Dhangar shepherds is not only one of the most important elements of the traditional cultural life of its region, but also a treasure of world literature. This volume presents translations of two lively and well-crafted examples of the ov?, a genre typical of the oral literature of Dhangars. The two ov?s in the volume narrate the stories of Biroba and Dhu?oba, two of these shepherds most important gods. Each of the ov?s tells an elaborate story of the birth of the goda miraculous and complicated process in both casesand of the struggles each one goes through in order to find and win his bride. The extensive introduction provides a literary analysis of the ov?s and discusses what they reveal about the cosmology, geography, society, and political arrangements of their performers world, as well as about the performers views of pastoralists and women. Anne Feldhaus is a Distinguished Foundation Professor of Religious Studies at Arizona State University. She is the author of Water and Womanhood: Religious Meanings of Rivers in Maharashtra and Connected Places: Region, Pilgrimage, and Geographical Imagination in India, as well as several other books on religious traditions of Maharashtra. She is fluent in Marathi and has lived in India for several long periods.